Lawrence & Associates > Blog > Personal Injury > When can a business be held liable for an independent contractor’s negligence? When can a business be held liable for an independent contractor’s negligence? The following post is part of our Law Student Blog Writing Project, and is authored by Sam Hoops, who is pursuing his Juris Doctorate at the University of Kentucky. In Pusey v. Bator, the court wrestled with the issue of whether a business can be held liable for an independent contractor’s negligence. Although the general rule regarding employer liability for negligent acts of a contractor acknowledges that the employer should not be held vicariously liable, the court here relied on an exception to the rule stemming from the “nondelegable duty doctrine,” specifically the “inherently-dangerous-work” criteria. The majority ultimately determined that the corporation could be held liable should the jury find that the independent contractor acted negligently. In Pusey, Greif Bros. Corp. (“Greif”), a steel drum manufacturer, owned and operated a manufacturing plant in Youngstown, OH. After several incidents of theft, Greif hired Youngstown Security Patrol (“YSP”) to “deter theft and vandalism.” Although the contract between Greif and YSP did not specify whether YSP guards would be armed or not, the superintendent of Greif had knowledge that YSP guards often carried a firearm while on the job. After several years of providing security for Greif, YSP hired a new security guard, Eric Bator (“Bator”), whom was not licensed to work as an armed guard, yet carried a firearm nonetheless while working the night shift. The facts giving rise to the case at hand began at approximately 1:00am during which time Bator was the sole guard on duty. Upon noticing two individuals, later identified as Derrel Pusey (“Pusey”) and Charles Thomas (“Thomas”), walking through Greif’s parking lot, Bator questioned the men of their intentions and ultimately ordered them to lie down on the ground with their arms out to their sides. Although Thomas complied with Bator’s orders, Pusey, while lying on the ground, made a quick movement like he was reaching for something in his back pocket, wherein Bator discharged his firearm, fatally wounding Pusey. As such, Pusey’s mother (“Plaintiff”), instituted a wrongful death and survivorship action against Bator, YSP, and Greif. At the trial level, Greif moved for a directed verdict, which was granted and subsequently affirmed on appeal by the Seventh District Court of Appeals. Although Greif argued that hiring armed guards does not create a peculiar risk of harm to third parties, the court disagreed and stated that because YSP guards were instructed to “deter theft and vandalism,” the work contracted for anticipated a confrontation between armed guards and persons entering Greif’s property. Therefore, the work that YSP was hired to do created a foreseeable and peculiar risk of harm to third parties, which was not a normal, routine matter of human activity. As such, the case was remanded to the trial court for a determination of whether Bator acted with negligence in discharging his firearm. Pursuant to the Ohio Supreme Court’s holding, upon a showing of such negligence, Greif should be held liable for the death of Pusey. In sum, a business may be held liable for the negligent acts of an independent contractor when the employer uses said contractor in a manner that most would consider inherently dangerous, i.e., there is a high chance that the contractor’s actions cause physical harm to others. Note from Lawrence & Associates: Most lawsuits related to injury or death are due to negligence, but this is not always the case. Some lawsuits have layers, such as the instant case where a company’s negligence enabled the intentional act of another party, and these actions in combination got someone killed. If you are trying to figure out whether you should contact an attorney about filing a lawsuit, consider the fact that a good attorney can investigate your claim and will sometimes find issues not immediately obvious to you that indicate you should file a lawsuit related to your injury or the death of a loved one. 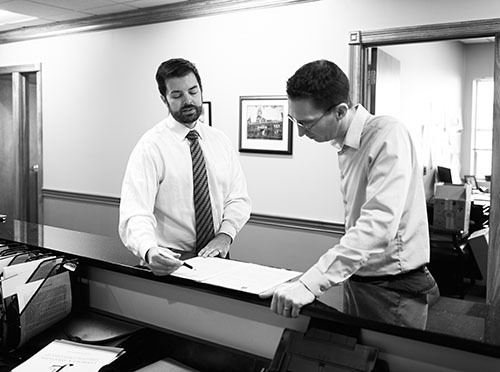 If you believe you may have an injury related lawsuit or insurance claim, don’t hesitate to call one of our attorneys for a free consultation. We’re Working Hard for the Working Class, and we want to help you!